It is true. Every coder did write 16bit x86 asm in the past. So they could do it again. They can! YOU CAN! 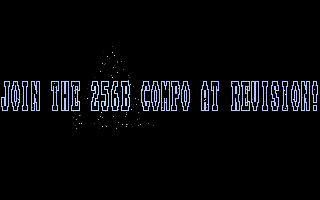 27 bytes of of it is ascii text itself I assume. 10 probably to push pop font stuff and initialize the rest. all remaining to transform the font pixels and add some random stars. Motivatro.. I like the name, aside of asm magic you guys do in the category.